The Disabled Veterans National Foundation (DVNF) (http://www.dvnf.org) is praising new efforts to address veteran suicide prevention by the Department of Veterans Affairs (VA). "While the VA’s new efforts are certainly warranted, the responsibility also lies within us as a society to help raise awareness and reach out to veterans who feel there is no other way out." said DVNF CEO, Joseph VanFonda (USMC SgtMaj Ret.). The Disabled Veterans National Foundation (DVNF) (http://www.dvnf.org) is praising new efforts to address veteran suicide prevention by the Department of Veterans Affairs (VA). An average of 22 veterans commit suicide each day, and DVNF urges that continued attention and awareness be paid to this major problem. 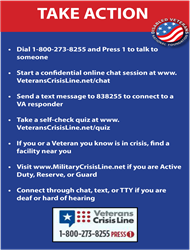 DVNF is calling on everybody to do their part to help spread awareness about the epidemic of veteran suicide and to help veterans recognize the resources that are available to them, including the Veterans Crisis Line, 1-800-273-8255 (Press 1). In 2015, Disabled Veterans National Foundation funded 34 different programs and initiatives, most of which were geared in some way towards addressing veterans’ mental health. The foundation’s next round of grant funding will be announced at the end of April, and will also be focused on the mental and physical health of veterans.